We’ve all been there: having just shelled out half a week’s-worth of pay on a brand new shirt/dress/top/jacket, the first thing you do is spill some type of food or drink all over it. Ruined – or is it? Whether it’s a leaky felt-tip pen or the result of absent-mindedly drawing on your own clothes during a boring meeting, ink is a pretty common type of clothing stain. Which makes it unfortunate that ink can be one of the harder stains to shift, depending on the type of clothing and ink. If the stain in question is a water-based ink, then you don’t have to worry too much; as the name implies, these inks are mainly water, and generally wash out pretty easily. However if you want to really ensure that the stain comes out, a quick spraying of stain remover should be sufficient. However with something like a permanent ink, you’re in trouble. Unless the clothing in question can be bleached, you’ll most likely only be able to fade the stain rather than removing it entirely. Careful application of rubbing alcohol (or nail polish remover if you’re desperate) is probably your best bet. It doesn’t matter if you’re drinking a latte or black coffee, if you spill it on your shirt it will stain, and it will stain badly. 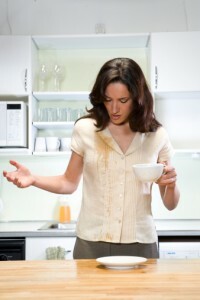 For a fresh coffee stain, try simply running cold water over the stain from the inside of the garment. If this doesn’t work, or if the stain is slightly older, try rubbing some liquid detergent mixed with water into the stain. After this, soak the clothing in water for about half an hour, rubbing the stain every five minutes. Red wine stains are possibly the most dreaded type of stain on this list; however they’re not necessarily as impossible to get out as you might think. Step one is to immediately sprinkle salt on the stain, as this will soak up the wine if it hasn’t had time to dry. If the stain has had time to dry, soak the stain in hot water, apply a stain removal mixture, and leave it for several hours. A scrape or a cut, the end result is a blood stain, a type of stain that can spell the end for a piece of clothing if you’re not careful. The most important thing to remember when dealing with a blood stain is that you need to deal with it ASAP. A blood stain can be removed if it’s recent, but after the best part of a day it will be there to stay. What you’ll need to do is apply full-strength white vinegar, and soak the stain for a good 10 minutes. After that, blot with a towel and wash. If you‘re in the market for a washing machine, check out the results of our customer satisfaction survey. And if it’s washing powder you’re after, click here. And click here for liquid laundry detergent survey results.